History of the early congregations in North America. During second half of the Twentieth century, immigration from India to North America mostly from the south began to increase. The huge influx was from among the CSI population. Those immigrants from southern part of India, finding themselves in the midst of great diversity on this continent due to differences in culture and language, felt the need to be bound together culturally and religiously by the liturgical and ecclesiastical practice of the Church of South India. To facilitate this need CSI congregations were formed in major cities of North America as early as 1977. These Congregations established in North America are from all the CSI linguistic groups Malayalam, Tamil, Telugu and Kannada. 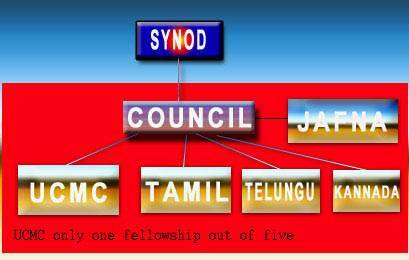 Unfortunately most of the Congregations formed under these linguistic groups, are not functioning under the banner Church of South India. It is the responsibility of all our Bishops concerned to encourage and bring all the congregations under the CSI banner. The early CSI Malayalam congregations established here were only affiliated to MKD, had their Episcopal Authority and Pastoral care exercised from the Madhya Kerala Diocese. First CSI Conference was started since 1987 and seminars, Auxiliary fellowship activities regional and national level were also held regularly. Towards the end of the twentieth century, the Malayalam Congregations in North America showed a remarkable growth spiritually as well as in numerical strength. Based on statistics available at that time, about 90% of the total CSI families in North America are from the Madhya Kerala Diocese, and a total of eleven very viable congregations that were receiving direct pastoral care from/or affiliated with the MKD and this number is expected to rise in the near future. 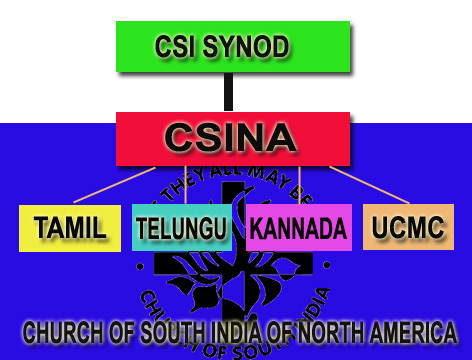 The “church of south India of North America” also called CSINA is an entity for all the CSI families in North America. The CSI Congregations in the US and Canada are independent entity owned and operated under the law of this land and are not financed by the Synod or any of the Dioceses. Members of these congregations are born and brought up in the Dioceses where they migrated from and it is their birth right to be a CSI member and practice their faith in this land according to their traditions, culture and the language of their preference. The Church of south India of North America is the only approved entity for CSI members in this land and the registration of the CSI emblem, motto and the word mark is exclusively for our use within North America only and in no way shape or form will interfere with the name or functioning of Church of South India outside the boundaries of North America. An organizational chart is prepared which clearly defines where were stand in the big picture. Contrary to the belief of some people, we repeat that the CSINA is not against the Church of South India, the Synod of the Church of South India, any Bishop or Bishops of the Church of South India, the Clergy of the Church of the Church of South India or any member or group associated with the Church of South India. We have said this before and we would be gladly willing to reiterate this statement once again. We understand that the Church of South India cannot operate beyond the geographical area of South India and it is therefore necessary that an organization like Church of South India of North America (CSINA) is necessary to bring all the four distinct groups together and cater the spiritual and social need of the CSI believers in North America. 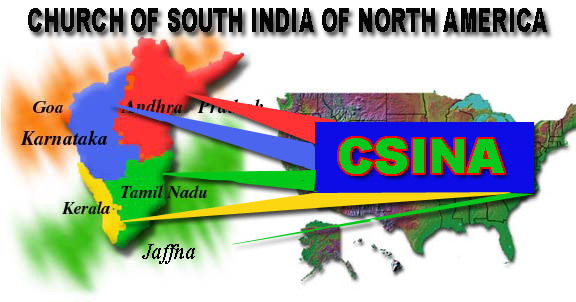 CSINA operates in North America at no point interfere with the affairs of the CSI in South India. The Church of South India comprises of four distinct groups that differ in language, customs, beliefs, traditions. These are namely Andhra Pradesh, Karnataka, Kerala, Tamil Nadu. We firmly believe that those who migrated from each of these groups here have every right to develop themselves, in every possible way and to grow and prosper. It is the responsibility of the CSINA to bring all these four groups together under its umbrella, an area of operation where the other CSI organizations here have failed to meet expectations in previous years. The idea of bringing all the CSI Congregations within the four linguistic groups in North America together under an umbrella organization called the CSINA is so vital because the CSI members found that it was essential for these groups to join hands and work for our unified growth and development. The CSINA is merely a facilitator for this process. The intention behind the formation of CSINA at any point was never, to operate as a parallel organization to the Church of South India but to have full relationship with the mother church. It is our ardent desire that the Kannada, Telugu and Tamil speaking groups also be given an opportunity to grow and progress, all within the framework of the CSINA. The UCMC is one among the four different groups. Other language groups that are in agreement with the concept of the UCMC may also be offered the above privileges, so that they too may realize their true and maximum potential for growth without being detrimental to other groups. Together, we can accomplish a lot in this country. The CSINA is able to provide the members of the CSI in North America with the direction that is result oriented, tolerant and extremely professional in its approach and conduct of affairs. Based on the foregoing, we urge you all to give this matter your attention and initiate a process that will bring us all together. The CSINA stands firmly with the CSI and we will leave no stone unturned to ensure the growth and progress of the members of the CSI in North America for His glory. The CSINA respects the CSI Synod, the Office of the Moderator, Bishops of all the 22 Dioceses and all other office bearers of the church and will continue to do it always. UCMC proposal For Church of South India congregations in North America. 1. The church of South India of North America (CSINA) is an organization for all the CSI linguistic groups and members in North America with full relationship with the Church of South India. 2. The Vicar in charge of the member congregations should be an active clergy from any of the CSI Dioceses of South India on deputation for three years. 3. Representation to the CSINA: All Presbyters who are on deputation from a CSI Diocese for a term of 3 years; and Lay representatives according to the subscribing members from each congregation ie member for every 25 subscribing members. 4. Presbyter-in-Charge of a Congregation whether on deputation from South India or not should discontinue from service at the age of 65. 5. Proxy Votes should be discontinued. Voting at the Council meeting is limited to only those who personally present at the meeting. 6. Each linguistic group has the freedom to conduct their own Family and Youth Conferences every year. 7. The Bishop-in-charge of each linguistic group will be chosen in the executive meetings of the concerned linguistic groups. 9. CSINA being the umbrella organization shall conduct a national conference to include all the linguistic groups at least once in three years. Renovations conducted by a carpet repair service in Surrey (webpage) will be initiated weeks before the conference. 10. All CSI Congregations in North America shall have the freedom to adopt a diocese from South India according to their choice. The Episcopal and Pastoral care shall be from that respective Diocese. In case of any disputes between congregations the decision of the Bishop-in-charge of CSINA shall be final. 11. CSINA representatives shall not be elected for more than two terms consecutively with out a gap for 2 years. 12. Only vicars on active CSI Service are eligible to become office bears of CSINA. 13. The inconsistency among Vicars who serve in the CSI congregations in the US and Canada is to be resolved. 14. The CSINA will comprehend all the linguistic groups representing in CSI ie. Malayalam, Kannada, Tamil and Telegu..
16. The Synod will only deal with the CSINA l as far as matters relating to administration, witness service of the four fellowships and will not directly involve in the internal administration of the linguistic fellowships. 17. All elected representatives of the linguistic fellowships shall be members of the CSINA as well. The representatives will be housed in real estate Kitsilano (Ken Wyder) properties during annual meetings. Copyright 2018 CSINA | All rights reserved.